The first visitor I had after I shifted into a new residence was my FIL. My MIL had sent us some raw bananas (plantains), broad beans and gongurra leaves with him that was grown in their backyard. How I wish I had a garden that I can indulge in. He also brought with him jasmines, roses that were grown in the garden too. Any way the moment I saw the plantains only this event came to my mind as the month is coming to and end and I have not updated my blog in over a fortnight. What could be fresher that the ones that my FIL brought with him and more over organically grown. 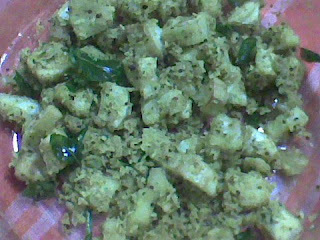 This is my side dish for sambar rice today. So here goes the recipe. Peel the skin of the bananas. Cube them and immerse in water to prevent them from turning black. In a mixie jar grind coarsely the grated coconut, garlic, turmeric powder, black pepper powder, 1 sprig of curry leaves, cumin seeds and salt without adding water. In a microwave safe bowl place the cubed bananas; sprinkle 2 tbsp of water and 2-3 drops of oil. Mix well. Close the bowl and microwave @ high for 2-3 mins till they become soft. 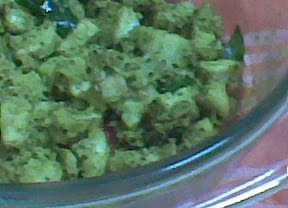 In another microwave proof vessel add the remaining oil, mustard seeds, urad dal and 1 sprig of curry leaves. Mix well and microwave @ high after partly closing the vessel for 1 min. Now add the micro waved bananas and coarsely ground paste and mix well. Keep the vessel open and microwave @ high for 1 ½ to 2 mins. Give 3 mins standing time and serve with sambar rice or rasam. This is off to Suma who is hosting Microwave easy cooking event featuring Fresh Produce this month a brain child of Srivalli. The raw banana pepper fry looks delicious as vazhakai is my all time favourite in any form. Banana pepper fry sounds gr8 and looks delicious!!! Seems delicious. I would love to try your version when I buy plantains next time.